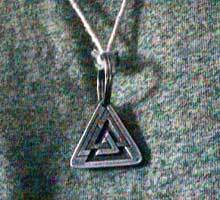 Three triangles created the emblem of the Fate Goddesses: Weird Sisters (from the Saxon wyrd, meaning 'fate'). Three of anything arranged in triads suggested a total of nine, so in some traditions the Fate goddesses became nine, like the Nine Morgans of the Fortunate Isles in Celtic myth. - In Scandinavia, the sign of fate was called the valknut, Knot of the Vala. A Vala was either a female spirit ruling the fates of men-a Valkyrie-or her representative on earth. The valknut is composed of three interlinked equilateral triangles. The nine lines symbolize the nine worlds of the Norse tradition, the power of three times three. Specifically, it is a symbol of Odin. As a protector, it invokes the power of eternal unity. Its name means "the knot of the fallen (or chosen) ones." The Borromean rings consists of three interlocking rings, with the property that if any one of them is removed, then all three separate. The name Borromean comes from the Borromeo family of Renaissance Italy, who used them as their family "crest". The shadow, a minimal projection of the rings, is the familiar 3-Venn diagram. By minimal projection of a knot or link onto the plane we simply mean a projection that has the least number of intersections. There is another interesting historical context in which the rings arise. The diagram was found in picture-stones on Gotland, an island in the Baltic sea off the southeast coast of Sweden. These are dated around the ninth century and are thought to tell tales from the Norse myths. To the Norse people of Scandinavia, a drawing of the Borromean rings using triangles is known as "Odin's triangle" of the "Walknot" (or "valknut" -- the knot of the slain). The symbol was also carved on the bedposts used in their burials at sea.